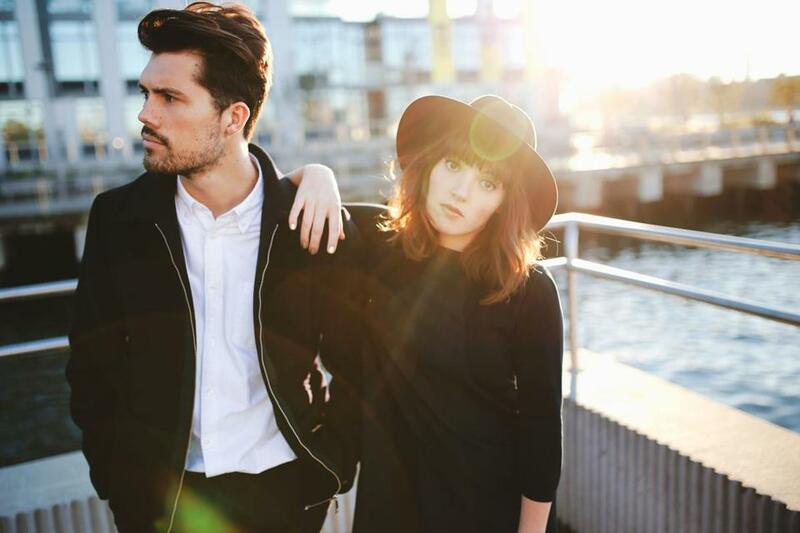 Anthony West and Josephine Vander Gucht make up the British alt-pop duo Oh Wonder. When Oh Wonder took the stage on Wednesday night at Northeastern University’s private concert venue, afterHOURS, an intimate setting with a maximum capacity of 276, there was a matter of inches between the London-based alt-pop duo, their mikes, and their mesmerized audience. Something feels right about watching the duo, comprising Josephine Vander Gucht and Anthony West, cast a seductive spell with one ethereal, exquisite tune after another in such close quarters. After all, blinding lights and booming amps are recent developments, implemented for the duo’s live shows. And by the time Oh Wonder has finished its first song, “Livewire,” Vander Gucht and West’s voices harmonizing over haunting piano strains, it’s clear the pair can still soar when separated from such adornments. Less than two years ago, Vander Gucht and West were friends in separate musical projects, and began writing and recording together on the side. Starting in September of 2014, the pair completed one song each month in their southeast London home studio, uploading it to SoundCloud free of charge. Their identities were a mystery, as were their intentions, but by the time their self-titled album arrived the following September, the online buzz was sufficient to warrant a worldwide tour — despite Vander Gucht and West having never set foot on a stage together. On Saturday, Oh Wonder concludes its first US tour with a sold-out show at the Paradise Rock Club. But just prior to enchanting a much smaller crowd at afterHours, the pair sat down to talk about Oh Wonder’s meteoric rise, why simplicity is a songwriter’s secret weapon, and how both of them have maintained their sanity on the biggest, most intense tour they’ve ever undertaken. Q. Playing at the Paradise this Saturday will mark the final stop on your debut North American tour. What has touring stateside been like? Josephine Vander Gucht: We’ve both been here before on holiday, mainly LA and New York, but this is the first time we’re playing here. And we’re loving it, because you get to see so many cities in such a short space of time. Anthony West: You wake up in a different city every day. JVG: Toronto is gorgeous. We both love New York — we’re big fans of New York. AW: We’re both going there tomorrow, got two shows tomorrow. JVG: We could live there, in New York. We could write an album there. It’s very similar to London and also very different from London, but it’s just an electric city. Q. I’m sure the venues have been interesting. AW: We’re starting to play big theaters, which is really cool. They’re these nice, big rooms that can fit 1,200 to 1,500 people. JVG: You have like two levels of people — there are people down on the floor, and up on the balconies too, so wherever you look, there are people connecting with your music, which is quite a nice visual. Q. That style of lighting — dazzling, but not complicated by design — mirrors Oh Wonder’s music. AW: Absolutely. Life can be very complicated, and I think it’s nice to have one aspect of your life — and for us that’s music — that’s just more simple. JVG: It’s a good talent as well, because if you can make something that speaks emotionally and effectively and widely to an audience at its bare bones, then it’s probably a good thing. We try to write songs in their purest forms then add layers that enhance, rather than building up all these layers of instrumentation and ideas, and shrouding a song in production. It’s important — really, in anything that you do — to make sure that the foundation and the core is very strong, and everything else just enhances it. There’s no need to overcomplicate things. AW: The way we’ll produce the songs is to layer them up to experiment and get a canvas of sounds, and then we’ll build up as many of those as we can. Then within that, we can pick away at them and find what really works together, pick two and three sounds and be like, “Oh, these really sound good,” those more ethereal sounds. And taking those, you can layer them up, but have six layers instead of a hundred. So it’s more about throwing a lot in there, just to be able to take most of it away. JVG: Even like the artwork, how we portray ourselves on social media, it’s all about our core. AW: So far, it’s been a lot of trial and error. Q. What have you found doesn’t work so well? JVG: On a wide, overall level, one thing we’ve realized that doesn’t work is not being yourself. We started out anonymous. We posted these very elusive, mysterious social-media posts — we didn’t say, Hey guys, we’re releasing music! We just kind of put up the songs very quietly, and that’s awesome, and it built traction. But now that there are people who are engaging with the music, what I’ve realized is that people latch onto people. So for us it’s really important that this whole project feels real and feels human, not that we have to give loads of ourselves to people but that we’re honest and sincere and not trying to be something that we’re not. Anthony and I are just Anthony and I. We do what we do, and that’s what we put up online, that’s the music that we make, it’s real honest, right? So what doesn’t work for us is trying to fabricate this whole fake aesthetic, a fake portrayal of ourselves . . . because people see right through it. Q. Is it a challenge playing a smaller set somewhere like afterHOURS in between all of these larger venues? JVG: It’s a huge challenge. The show that we’ve built is designed for venues that can accommodate our lights, that can accommodate space, that can accommodate room for us to move around, to engage with the audiences. Tonight, we don’t have any lights, we’re not allowed any. AW: It’s like we’re performing naked, you know? Just relying on our music, which everyone can hear through this quite small sound system — it’s more bare. Today is far more of a challenge. I always think the scariest thing I could do as a performer is to perform in front of five people; that’s my biggest fear. There’s something about a mass of people which takes some pressure away. Q. You’ve been touring since the album released last fall, you were both on “Conan” last week, and Halsey just announced you’re opening on the last leg of her summer tour. How does it feel to have so much happen in such a small stretch of time? AW: We only played our first show together in September! JVG: It’s one of those things you can’t really explain, because it all feels like a dream. When I go home and hang out with my friends, and they’re like, “How was tour?” and I’m like . . . [throws hands up] I can’t put it into words. [laughs] It was tour! It’s so unlike normality and routine and structure, and waking up and cooking yourself breakfast and going to school and having a day and coming home and seeing your friends. It’s not like that at all. You have these endless days of traveling and waiting and preparing, and then these massive highs of adrenaline and magic and excitement in one hour of the performance. Q. Even with that mindset, does the excitement of what’s coming up for Oh Wonder, be it opening for Halsey or working on a new album, fuel you? JVG: I don’t think it does, and I don’t think that’s a bad thing that the excitement doesn’t fuel me. It’s as Anthony said: This has really taught me to live in the present and enjoy the moment. You know, otherwise you’ll blow up. It’s too exciting to think about. Q. Your first album took an unusual route to release, with one single coming out every month on SoundCloud. Will a follow-up replicate that? AW: No, because of what we’re going through now. We’re going to have to write the next album whilst on the road, in between tours and stuff, so it will make for a totally different second album, and a more traditional album in that sense that we’ll be writing the record as 10 songs, not 10 singles. JVG: Which we’re looking forward to. It will be good to have perspective, because whilst we were uploading songs monthly, we had no idea we were even making an album. It sounds really silly, but the idea of an album at the end of it was just not a tangible goal or a focus. It was very much about one song every month, living in the present, so it will be very nice to work on an actual record. Isaac Feldberg can be reached by email at isaac.feldberg@globe.com, or on Twitter at @i_feldberg.